You feel hunger if you don't eat. Although you think hunger is a discomfort in your stomach, it's not. The emptiness in your stomach makes you feel a negative effect in your head. Hunger is a source of unhappiness like loneliness or humiliation. If you don't do or feel enough of the left column above, then you begin to feel the right column. And the longer it has been since you have done or felt the left column, the stronger the right column is. The right column stops when you do or feel the left column again. 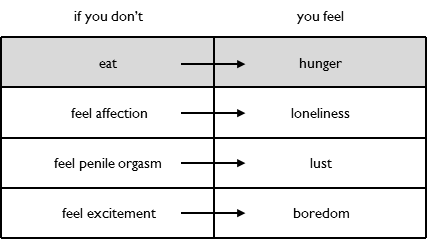 Hunger, SADS, thirst and cravings use the same mental mechanism and have a similar purpose. All four are negative mental effects that you feel when you don't consume enough of an input your body needs. If you don't eat enough, you feel hunger. If you don't get enough sunlight, you feel SADS. If you don't drink enough water, you feel thirst. If you don't get enough of a particular source of nutrition, you get a craving. Revenge is best managed when you are not hungry. Revenge is an emotion that causes you to punish rule breakers even if it harms you. It is best to avoid feeling revenge by avoiding situations and people that are likely to make you feel it. Where you cannot avoid revenge situations, it is best to resist retaliating against rule breakers. Resisting requires that you tolerate the negative mental effect of revenge. If you are hungry and feeling revenge, you have two negative effects to tolerate. This makes it harder to resist retaliating. The negative effect that will stop seems to be much larger because it includes hunger. Make sure you are not hungry when you have to commute. Maybe keep a snack in your car or briefcase. Dieting requires also managing hunger. Dieting works better if it does not leave you less happy. If you diet, you will feel less pleasing taste and more hunger. To offset this loss of happiness, you can feel more positive emotions - like affection or pleasing scenery. In the short term, you need to offset the loss of pleasing taste and the arrival of hunger. You could double your socializing and your vacations. On an ongoing basis, you will only need to offset the loss of pleasing taste. You will stop feeling hunger once your metabolism adjusts to your new lower weight. You may only need to double your socializing or your vacations.